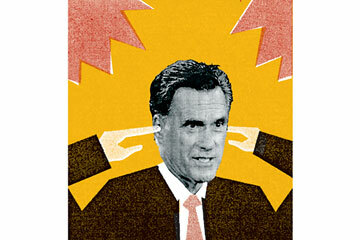 Would Romney really reject the bellicose neocon wing of his party? Back in George W. Bush's second term, when diplomatic realism began to overtake foolish bellicosity, the President developed one of his patented nicknames for the two most powerful neoconservative journalists, William Kristol and Charles Krauthammer: he called them "the Bomber Boys." They were unrelenting in their desire to unleash American force anywhere, at any time, especially in the Middle East. They've been even worse during the Obama Administration, plumping for endless war in Iraq, Iran, Afghanistan and Syria. And so I was curious to see how the Bomber Boys reacted to Mitt Romney's Gandhian performance in the third presidential debate, in which he agreed with the President's policies on all of the above. They loved it. It was presidential, Kristol said. It was strategic, Krauthammer said, adding, "I think those on the right, like me, who would have loved for him to have been bellicose ... will understand exactly why Romney did it." I doubt that. The reason Romney slouched away from his neoconservative chest-thumping of the past year is simple: people don't like it. There is a negligible constituency for neoconservatism in the hinterlands, and for good reason. It has been proved a bloody failure over the past decade--and Obama's more subtle and multilateral policies, while often messy, have been far more successful. (Messy is unavoidable in the Middle East.) So there was Romney agreeing with the President on 11 previous areas of disagreement, by my count, almost all of them a desperate flight from positions espoused by the Bomber Boys. Obama was so nonplussed by this that he said to Romney, "You'd do the same things we did, but you'd say them louder, and somehow that would make a difference." I suppose we should be heartened by Romney's performance. It could mean that the neoconservative era is coming to a close. But the ongoing, distortional impact of this tiny policy cult was evident during the debate in another way: Israel was mentioned 34 times. India, an essential ally, especially when it comes to the terrorist threat emanating from Pakistan, was not mentioned at all. The euro crisis, which could have a profound effect on our economic future, was not mentioned at all. Climate change, perhaps a global existential issue, was not mentioned at all. Israel is a great friend and ally. Its creation was a historic act of international justice, and it has done exceptionally well as a nation, blending together immigrants from a staggering variety of countries, building one of the world's most creative economies and a powerhouse military. It is, without question, the strongest nation in its neighborhood. It can defend itself. And yet the neoconservatives seem obsessed with threats to Israel--and they foolishly conflate those threats with our national security. Their overhyped fixation on Iran is the most obvious result of this delusion. (A nuclear Iran is not the greatest threat to America's security; a Salafist coup in nuclear-armed Pakistan would be far more frightening.) Neoconservatives favored the war in Iraq because it would make the world safer for Israel. And there are neoconservatives who argue that we should distance ourselves from Turkey, a crucial ally, because its relations with Israel have deteriorated.